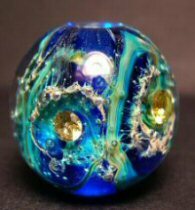 Thanks for visiting our lampwork glass art page! Karl and I both LOVE working with glass and creating these small works of art. Our regular clients can usually tell who made each piece, as our styles are completely different, which keeps it fun and interesting and hopefully offers more options for everyone to create with! 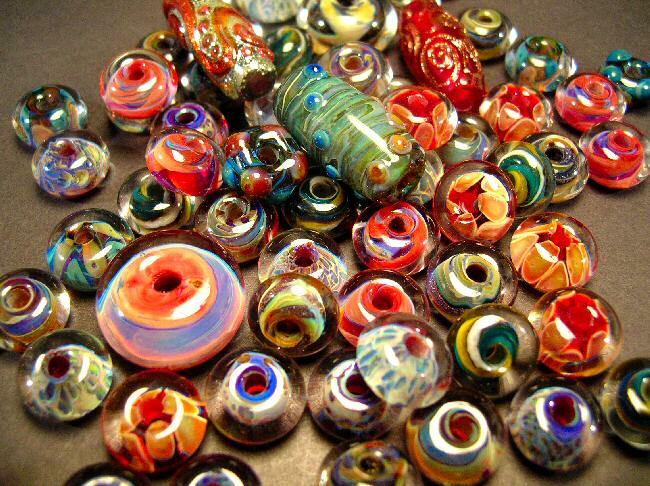 All of our lampwork glass pieces are created with special attention, love and care, using the finest Italian (Moretti), American (Bullseye), German (Lauscha) and Borosilicate glass composites. Our primary torches are manufactured by Bethleham Torch Co. and offer the extreme versatility required to execute most of our projects. After each individual creation,Â pieces immediately enter a digitally controlled kiln where they areÂ heat soaked for hours before a carefully selected four (4) stage computerized annealing process takes place.Â Once beads are finished annealing overnight, they are carefully cleaned under water and holes are thoroughly dremel filed to remove all remnants of bead release (kiln wash). The result is a beautiful, durable and long lasting piece of wearable art! Many more details about our lampwork can be found on our "What is Lampwork?" page. The great thing about our site is that we don't just create glass beads and stop there, we offer silver accessories, handmade glass sculptures and fine handmade artisan jewelry as well. For those who need instant gratification, our products can be purchased here on our site using the Paypal "buy it now" button displayed with each item for sale. For those who are competitive and like the bidding environment, we also offer several gorgeous focals and borosilicate beads sets on eBay under the username 5fishdesigns, or simply visit our online store! We also specialize in custom orders. 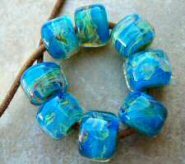 If you see a set or focal bead of ours that you like but would like a different color scheme (or style) email us and we can create it for you. 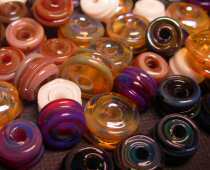 We do stay pretty busy so please allow about a week to create your personalized beads.